1 Corinthians 10:31 tells us that all we do should glorify God. 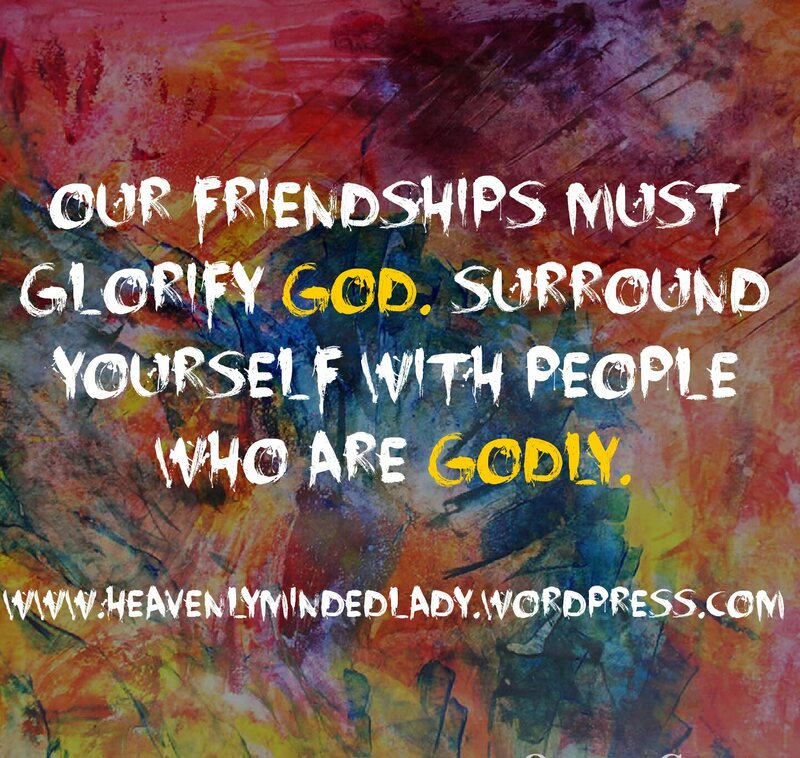 In this context, our friendships should glorify God. People who watch or observe our friendships should be pointed to Christ. Our friendships should be a form of service to God. From the various Biblical examples, friendship is a valued relationship which actually involves caring for someone else other than yourself . one thing is certain, friendship is a gift and we definitely need to appreciate God for the gift of friendship everyday. As with every other area of our lives, we need God in our friendships. If you do not have friends and you actually want friends, remember that to find a friend you need to be a friend (Proverbs 18:24). 1) Godly friendships draw us closer to God. They encourage us in the faith ( Psalm 119:63). The Godly values of your friends will surely rub off on you. If you are struggling with your faith, you may be hanging around the wrong people (Amos 3:3). 2) Friends are always truthful. A friend who is Godly will not spare the truth. No, not even when it hurts. Lies and flattery are not righteous attributes (Proverbs 27:5-6). 3) Carefully select your friends. Not everyone can be a close friend too. Ask God for discernment when choosing friends. It is often said that quality trumps quantity. Wrong friendships are detrimental to our Christian lives (Proverbs 22:24-25, 16:29, 13:20). 4) Godly friend set and respect boundaries. In Proverbs 25:17, the Bible asks us to give boundaries or space to our friends. Generally speaking, our God is a God of boundaries. We have freedom in Christ but there are limits to the things we do e.g. we do not worship other gods or idols. 5) Friendship should be reciprocal in nature. Because friendship is a two way street, to thrive, both parties need to contribute. This is a very important feature of friendship and it should not be overlooked. When one person does all the listening, giving, caring, loving, praying etc, it is not a friendship (Proverbs 27:17, 19). 6) Godly friendships should have honour and respect. Every relationship requires respect to thrive. Friendships without the elements of honour and respect are usually marked by: gossip, jealousy and frequent strife. What you say about your friend in his/her absence should show how much you respect her (Proverbs 25:9-10; 11:9,12; 17:28). 7) A Godly friendship is very consistent. Your friend should be your friend at all times. Friends should love each other at all times, just the way Jesus loves us always (Proverbs 17:17). While you hold people up to these standards, work on yourself and ask God to make you a Godly friend!